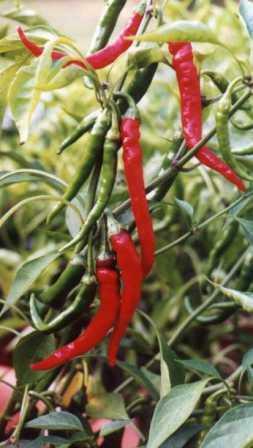 Growing Cayenne Peppers is best in hot weather, full sun, and moist well drained soil. In most areas of the US it's grown as an annual, but in frost free and low frost areas it can be grown as a small perennial shrub. This fruit is red when it's mature and has a hot strong taste; the smaller they are, the hotter. The seeds of Cayenne Pepper are hotter than the pod. The seeds of Cayenne Peppers contain a chemical compound called capsaicin; believed to have antibiotic properties. Planting depth (inches): cover seeds with soil. Diseases: Anthracnose, Bacterial Spot, Bacterial Wilt, Blossom End Rot, Elephant's Foot, Fusarium Stem Rot, Leaf Spot, Pepper Stem Scald, Phytophthora Blight, Southern Blight, Tobacco Mosaic Virus, Tomato Spotted Wilt Virus, Wet Rot.